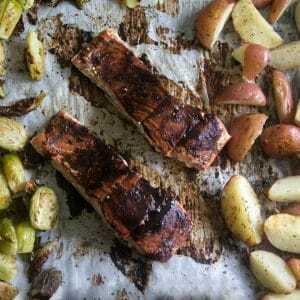 Sheet Pan Balsamic Glazed Salmon, Potatoes and Brussels Sprouts, is a one-pan super quick and easy recipe for any weeknight meal! Perfect for entertaining guests! 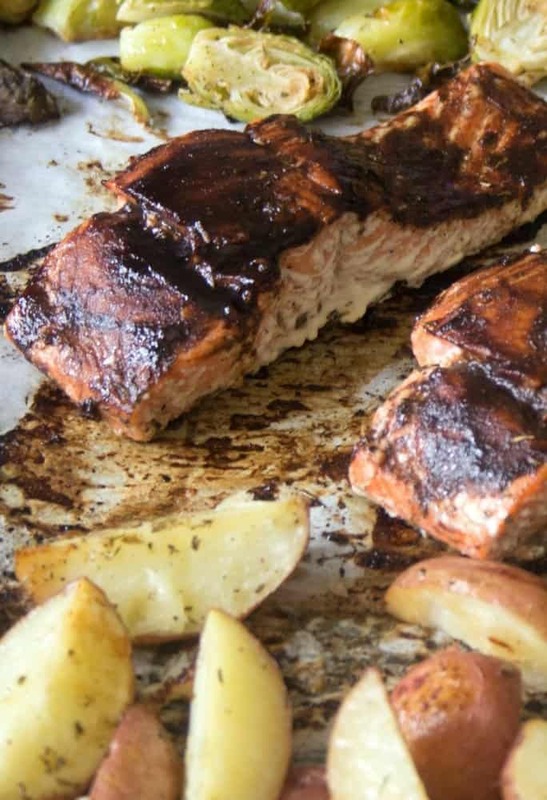 The balsamic glaze adds a tangy flavor to the salmon! Any regular reader here knows I love to cook, hate cleaning the dishes! That is just one of the reasons I love sheet pan meals! I also love easy meals that require little prep time and taste amazing! Another great thing about this meal is if I don’t have Brussels Sprouts, or heaven forbid, you don’t like Brussels Sprouts, swap them out for a different veggie! By the way, if you don’t like Brussels Sprouts, try Brussels Sprouts with Prosciutto, it may just change your mind, it converted my sons! 🙂 Back to this meal, this salmon dinner is one pan, easy, delicious, and perfect if guests are coming over! This recipe is easy to interchange the side because to use what is in your fridge or personal preference. If you feel like eating fewer carbs, use another veggie! I would recommend cauliflower or spaghetti squash as I did in Sheet Pan Chicken Sausage, Peppers and Onion over Spaghetti Squash! A spaghetti squash would be an excellent alternative to the potatoes! Same goes for the Brussels Sprouts, don’t have any, use another veggie, such as carrots or parsnips! By the way, we can still be friends if you don’t love sprouts! Cook the potatoes and brussels sprouts about 25 minutes before adding the salmon. During that time, make the Balsamic Glaze. The glaze will become syrupy. You know what goes amazingly well with this salmon dinner, Strawberry Vodka Slush Cocktail or this awesome sangria. Save this recipe to your FAVORITE PINTEREST BOARDS! Follow me on PINTEREST for the most up to date recipes! 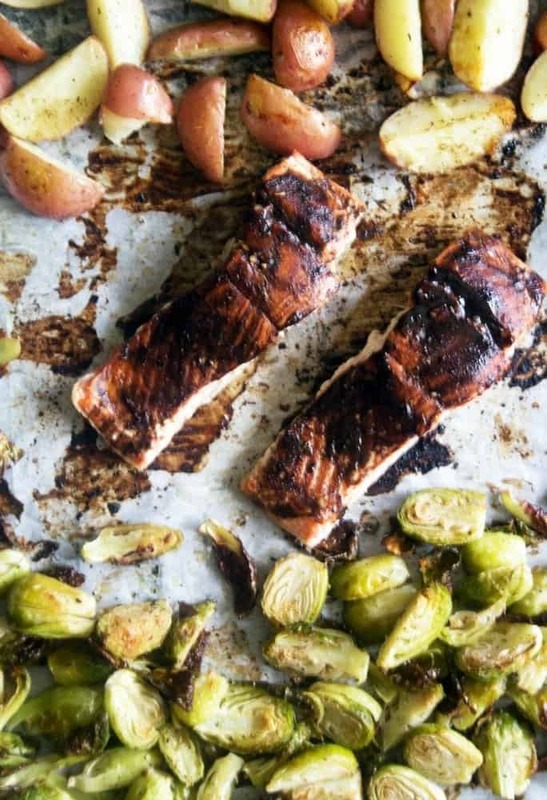 Enjoying Sheetpan Salmon, Potatoes, and Brussels Sprouts, giving it a 5-star rating and any comments are super helpful for me and very much appreciated! An easy and delicious sheet pan meal. 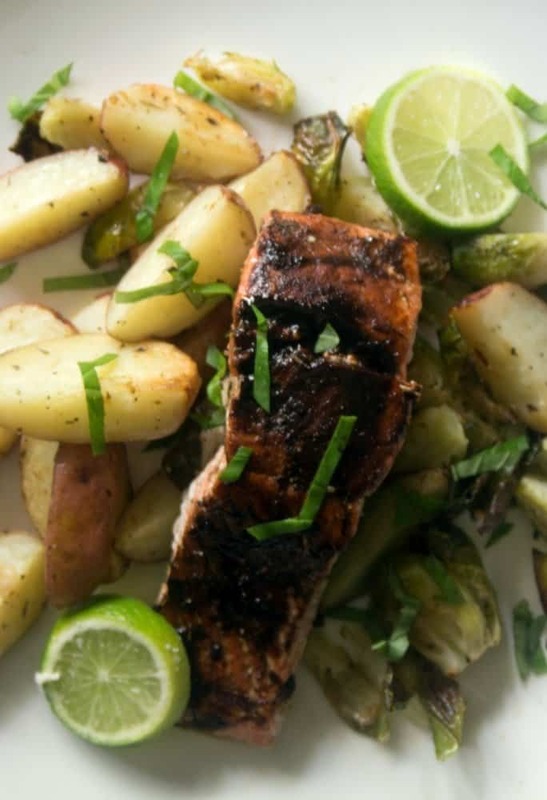 Salmon is glazed in a balsamic vinegar glaze and roasted with baby red potatoes and Brussels Sprouts. Perfect for any night. No fuss meal is perfect for entertaining. 1 pound baby red potatoes, cut in half leave skin on. Preheat oven to 425 degrees. Combine Herb De Provence, onion powder, garlic powder, black pepper, and salt, set aside. Line a large sheet pan with parchment paper. Add the potatoes and Brussels sprouts. Season with olive oil and 3/4 the herb mixture. Mix well onto the potatoes and Brussels Sprouts. Roast veggies for 20-25 minutes. In a small saucepan combine the balsamic vinegar, lime juice, Dijon mustard, and maple syrup. Bring to a boil. Let cook until the mixture forms a syrup. It should coat a spoon well. Usually takes 5-7 minutes. Set aside. Remove the veggies from the oven after 15 minutes. 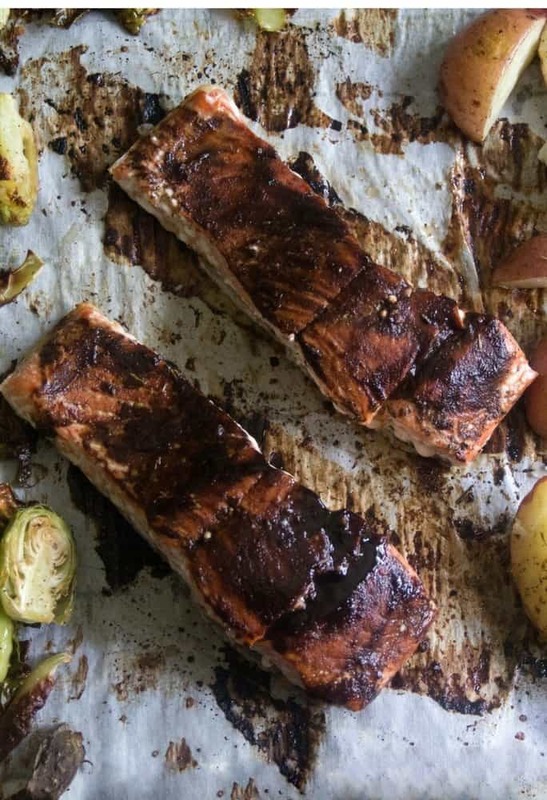 Add the salmon to the sheet pan. Brush the salmon with remaining herb mixture and the balsamic glaze. I am not a registered dietician, however, I do my best to provide the most accurate nutritional information. Any nutritional data I provide is an approximation and actual dietary information can vary based on ingredients and proportion sizes. We made this tonight for dinner. It was super easy and loved only one pan. The balsamic glaze was awesome.